Knitter's Pride cords are flexible and resilient without kinking or twisting. The join is smooth so stitches slide along easily and it features a long threaded screw-in for extra security. A specially designed cord key is included for easy tightening. About the Cords: Black cords with silver colored joins. - One key for tightening. Note: These cords measure shorter by themselves. These cords have to have the tips attached to give you the total length circular desired. Tunisian crochet hooks attached to these cords will measure longer lengths than circulars. Note: Package labeling shows the full length of the cord with interchangeable tips attached. Single cord (Length = 8" (20 cm to make 40 cm / 16" Circular). For use with KP Short Tips Only! Single cord (Length = 11" (28 cm to make 50 cm/ 20" Circular) For use with KP Normal Long Tips. Single cord (Length = 14" (35 cm to make 60 cm/ 24" Circular) For use with KP Normal Long Tips. Single cord (Length = 22" (56 cm to make 80 cm/ 32" Circular) For use with KP Normal Long Tips. Single cord (Length = 30" (76 cm to make 100 cm/ 40" Circular) For use with KP Normal Long Tips. Single cord (Length = 37" ( 94 cm to make 120 cm/ 47" Circular) For use with KP Normal Long Tips. Single cord (Length = 49" (125 cm to make 150 cm/ 60" Circular) For use with KP Normal Long Tips. Please note that needle tips are not included. You will have to purchase them separately. 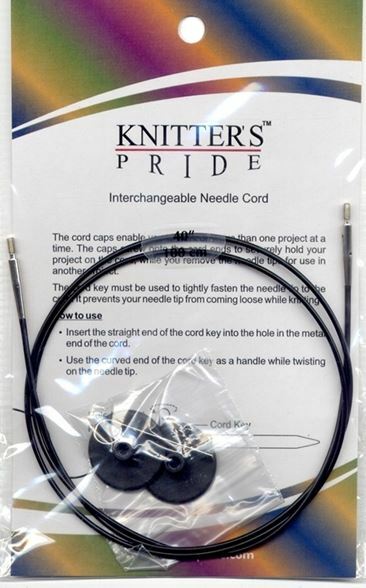 Knitters Pride interchangeable cords will fit all Knitters Pride interchangeable knitting needle tips and Tunisian interchangeable crochet hooks that are sold separately. Tunisian crochet hooks attached to these cords will measure longer lengths than circulars. The variety of sizes available here compliment any project! I like LONG cords to knit 2 at a time toe up socks. To keep me from getting completely tangled, the length is helpful. They shipped this so fast I could start the socks 2 days after I ordered! Thank you! Q: Will the8” length fit the ginger size short 17” size tip? Yes they will. This will make a 16 inch circular with the short tips attached. Q: Do the cords fit the Symphonie needles? Is the 16 inch usable on the Symphonie needles? I am considering buying the interchangeable set and noticed the 16 inch is not included in the set. So if I want to buy extra cords, I need to know they will work on this set. Thank you. The cords to make 16 inch circulars are not included with this set and are not recommended by Knitter's Pride. This set contains the long tips (approx. 4-1/2 inches long) that are used with cords to make 20 inch and up through 60 inch circulars only. The short cords to make 16 inch circulars would make it nearly impossible to knit. The tips themselves together would be longer than the cord portion and is why they are not included or recommended. I hope this helps and thank you for asking.